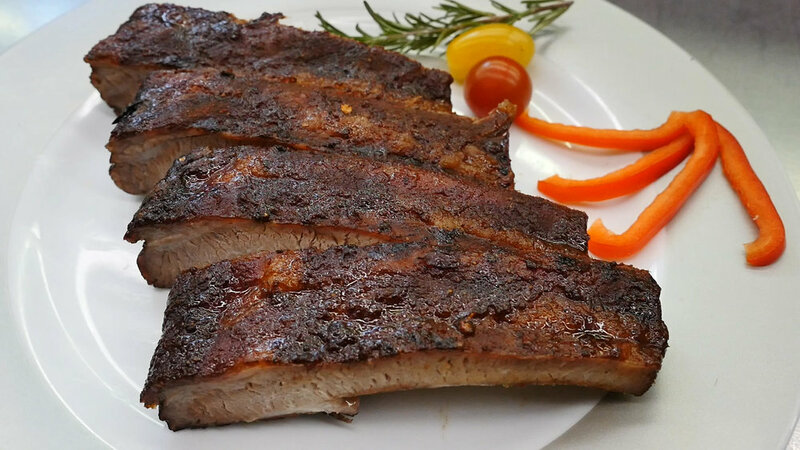 How to use Robb's Ribbs Amazing BBQ Glaze on just about anything! Create genuine BBQ flavor in your home oven. Follow these simple steps for delicious St. Louis style ribbs. or your favorite cut of meat! ... in an even layer and let set for 1 hour at room temperature. For St. Louis Ribbs cook approximately 225 degrees for about 4 hours in a conventional oven or until desired doneness. Adjust as needed as needed for convection oven. Start with a 2 lb rack of baby back or St Louis trim ribbs. Peel any membrane from the underside and salt. Bring BBQ to 500+ degrees for initial searing. Sear both sides until lightly marked (2-3 minutes per side). Turn down the grill to 220 degrees for low and slow cooking. Place on upper tier or idirect heat. Cook for about 2 hours until the desired doneness. Remove from grill and apply about 2/3 cup of Robbs Ribbs glaze to meat surface. Return to indirect heat and finish for about 20-30 minutes to caramelize the glaze. Let ribbs rest for 5 minutes and enjoy!!! The liquid can be water or a combination of beer and water. We recommend a 60-40 water/ beer combination. By trying different liquid combinations you can create your own “signature” BBQ sauce. Add liquid to a small sauce pot. Add 3/4 cup of Robb's Ribbs dry BBQ sauce to pan. Incorporate dry sauce until dissolved in liquid and bring to a simmer. Simmer gently for 5-7 minutes. Your Robb's Ribbs BBQ sauce is ready to use on your favorite BBQ meats or it can be refrigerated for 3 weeks for later use. Season Heated Pan liberally with non-stick spray. Sear both side of burger patty to almost desired doneness. Robb's Ribb's glaze is used to finish surface. Turn heat down to medium-low. Apply about 2 teaspoons of Robb's Ribbs Dry Glaze per patty side. and spread evenly. Flip glazed side down. Finish 15-20 seconds to caramelize the glaze. Repeat on second side. Serve and top with favorite condiments.